There can be few things more frustrating in football than coming out second best against one particular rival time and time again. 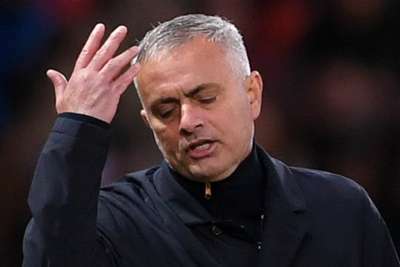 That is a fate that has befallen numerous clubs over the years and few examples are more notable than Manchester United's struggles at the hands of Chelsea. Despite both clubs occupying the upper echelons of the table and boasting sizeable playing budgets, there has been an emerging and growing imbalance in their head-to-head record. The two meet again on Saturday as Jose Mourinho faces up to his former employers and here we take a look at some of the more one-sided rivalries of recent times, with the help of Opta data. The all-time record may heavily favour United, who have won 74 and lost 53 of the 180 meetings in all competitions, but since 2012 Chelsea have had the bragging rights. It is a rivalry created by the London club's emergence into the top-flight elite, for which Roman Abramovich's arrival in 2003 was the catalyst. The first Abramovich-era clash saw Chelsea run out 1-0 winners, but it is over the past six years that they have really stamped their authority on clashes between the two. After a controversial 3-2 loss at Stamford Bridge in October 2012 in which Branislav Ivanovic and Fernando Torres both saw red, Chelsea faced United four more times that season without losing. In fact, a dose of revenge was served just three days later in a 5-4 League Cup success. Including that nine-goal thriller, Chelsea have lost just twice in 16 matches against United, although the last of those defeats came in the clubs' previous league meeting in February. Paris Saint-Germain against Marseille is another fixture where the overall record hides the true nature of this clash these days. It is a heated derby between arguably the two biggest clubs in France, but – as with Chelsea – PSG's dominance has become particularly apparent since 2012. PSG's unbeaten streak against their rivals now stretches to 17 matches and they have kept clean sheets in eight of those. Worse still for Marseille, the last three losses have come at the expense of 11 goals conceded, although a 2-2 draw amid that run did help to restore a modicum of pride. With Rudi Garcia's men already 11 points behind the Ligue 1 champions, victory in their next meeting on October 28 is vital if they are to hang on to the Parisians' coat tails. Okay, so it will come as little surprise that Barca have repeatedly got the better of this derby, as the Camp Nou club have a winning record against most teams. However, the extent of their superiority is quite remarkable, with Espanyol having won an away El Derbi match in the league just once since the 1981-82 season. That solitary success came in February 2009, when Ivan de la Pena's double against his former club secured a 2-1 win. It was but a bump in the road for Barca, who went on to win the league, and they have since more than reasserted their authority. There have been numerous thrashings dished out by the five-time champions of Europe, including a 5-0 LaLiga drubbing in September 2017. At home, Espanyol have not fared much better, failing to win the last 11 league meetings. Credit where it is due, though, Espanyol grabbed a 1-1 home draw in the most recent meeting in February and prevailed in a first-leg Copa del Rey clash the month before, albeit they were ultimately beaten in that tie. Manchester City swept all before them in the Premier League last season, racking up 100 points and 106 goals. But Jurgen Klopp's Liverpool provided a sterner test than anyone, for the most part. It must be said that Pep Guardiola did oversee a resounding 5-0 win over the Reds early in the campaign, but the tide turned after that. Liverpool won the next three clashes, inflicting one of only two top-flight defeats on City and dumping them out of the Champions League. The recent record has been made no less flattering for Liverpool following this month's 0-0 draw at Anfield, with the Merseysiders having lost only twice in the last 11 matches against City, one of those a penalty shoot-out reverse in the 2016 League Cup final. With a title race firmly underway and these two clubs at the centre of it, the January meeting between them at the Etihad Stadium could be pivotal.